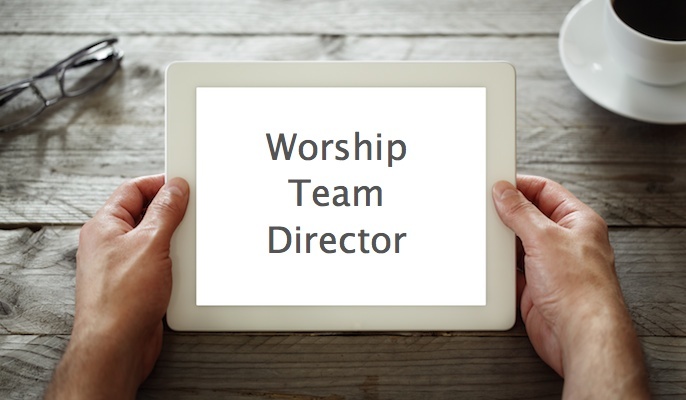 From time to time I like to share with you tools that I find extremely helpful in worship ministry. 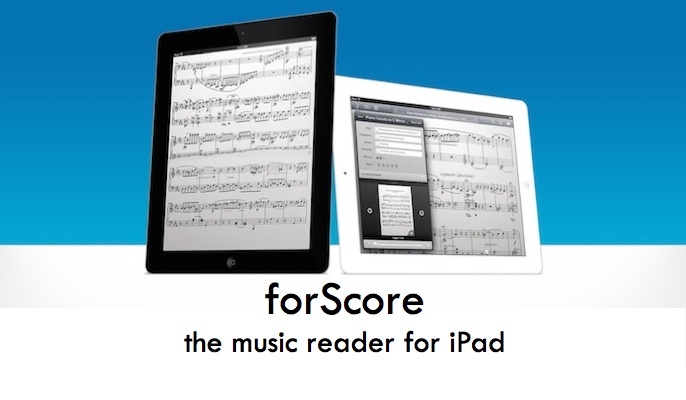 One of my favorite apps is forScore. I am able to keep my entire library of music within this app and have many powerful tools at my disposal. In a brief overview, I am able to store all of my musical scores in the library. 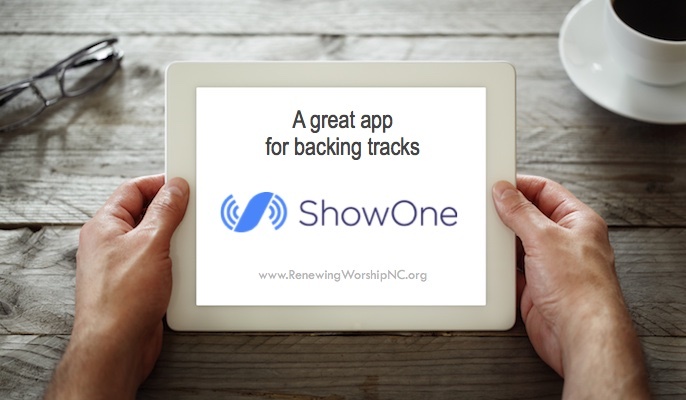 When I plan a worship service, I can create a setlist of the music needed for that service. Then, when I open the setlist, the music flows from one song to another, pages turned by a simple touch to the screen or with an optional bluetooth foot pedal. You can make annotations throughout your music, share your marked up scores with other band members, sync your iPad with others so pages turn together, and so much more. For ten bucks, it is a great deal! Get it at the app store here. When it comes to annotation, forScore’s flexibility is unparalleled. Create and edit an unlimited number of fully customizable drawing presets. Add text to your page with adjustable font styles, colors, and sizes, and leave clumsy controls behind: forScore’s text boxes adjust their height automatically as you type. Place common musical notation symbols on the page with their unique stamps feature, and even draw or import your own designs with their built-in stamp creator. With features like snapshots, undo/redo support, stamp tinting, and the ability to view embedded PDF annotations, it’s easy to see why forScore’s annotation support is simply the best in its class. Use setlists to group and arrange scores manually, like playlists in iTunes. View and play through them in their original order or sorted alphabetically, by least-recently played, or on shuffle. Create as many as you like and share or duplicate them as needed. Handle repeats with style by creating a link between two pages of a score. Tap on a link, and you’ll be taken to the target page where a signal will flash twice, showing you exactly where to begin playing. If you don’t have a free hand or you need to make bigger changes to the overall layout of your score, use the Rearrange tool to reorganize, duplicate, or delete pages of a score and then flip through them in order (perfect if you’re using a page turner). Don’t worry if you’ve got one long PDF file with multiple songs within it—with forScore you can create a bookmark for each piece and it’ll appear in your library just like any other file. 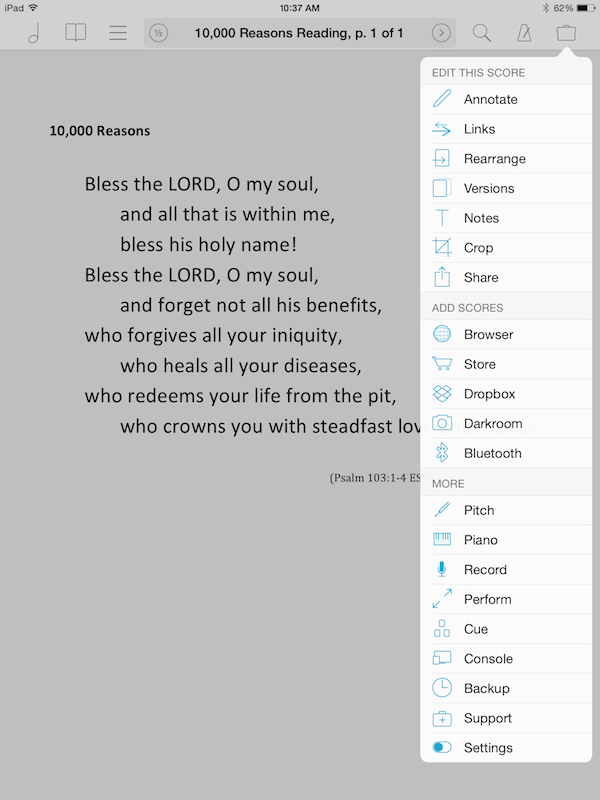 Think of it as a virtual score that has its own metadata, annotations, links, and notes, and can even be added to a setlist independently of the PDF it comes from. If the master file has a table of contents, you can also use that information as a starting point for creating your bookmarks. 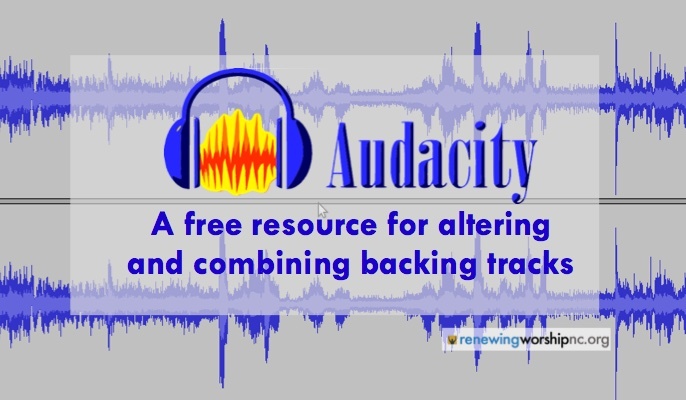 If you have an audio track for a particular score, track binding makes it easy to listen while you follow along, to use a backing track, or to loop a section while you practice. Use the metadata panel to find the right track (or tracks), and forScore’s media playback controls will automatically take care of the rest. Whenever you open that score, the audio track will be queued up and ready to go. You can also record your own practice sessions and share them with friends or review them later at full, three-quarter, or half speed. If there’s anywhere that performance really matters, it’s with a metronome. The app has a great built-in metronome. From the start, forScore was designed to put your music front and center, without any distractions or clumsy controls. There’s no way around it, though: the iPad’s display is smaller than a typical sheet of paper, which is why they’ve included two tools to help you get rid of margins and take advantage of every inch of screen real estate. If all of your margins are about the same, you can set a zoom level for all pages at once. If any page needs more precise positioning, the crop tool is right for the job—it’ll even scan your page and automatically suggest the optimal crop zoom and offset! When you turn your iPad sideways, some apps use the extra width to show you menus that you may not always need. With forScore, you get a better view of your score instead: the page expands so that the width fills the longer side of the screen, and the rest of the page extends down beyond the bottom edge. Drag the page up and down as needed, or tap and swipe like you normally would and the software pages up and down automatically. If you prefer, you can use an optional two-page landscape view instead and get a broader overview of your scores. It’s easy to switch back and forth, too, with a toggle built right into forScore’s main toolbar. Connect your Dropbox, Google Drive, Microsoft OneDrive, and Box accounts to upload and download scores, setlists and more. You can even connect to servers using WebDAV or FTP, so you’ll be ready for almost anything. Email your scores, send them to other PDF-compatible apps, share them with other nearby forScore users via Airdrop, upload them to Dropbox, or print them out with AirPrint. If you’re working with other forScore users, you can send a special 4SC-format file that contains annotations, metadata, links, notes, and more. It starts with libraries, the broadest way of categorizing your scores. Create a library for each band you’re in, each instrument you play, or for each musician that uses your iPad. Scores can be part of one or more libraries if needed, and a single, default library lets you work with everything on your iPad at once. Page turns can be more than just distracting or annoying, they can be impossible when you’ve got your hands full. A Bluetooth page turner makes page turn pauses a thing of the past—set it on the ground next to you, and tap the pedals with your foot to flip between pages. You can even assign specific tasks to auxiliary pedals, giving you instant access to the tools and menus you use most often. If you’re playing in a group, Cue might be just the thing. A leader handles program changes and page turns, and nearby iPads can follow along automatically. If you’re using an audio track with a particular score, use Replay to automate your page turns: listen to the song once and turn pages as needed, then watch as the pages turn themselves on subsequent plays. If you’re using forScore’s built-in metronome instead, automatic page turns are a great option. Type in the number of beats or measures on each page of your score, start the metronome, and the app handles the rest. Links are a great way of handling repeats, but you’ll still need to reach up and tap the screen to use them. For a truly hands-free experience, the rearrange function is a much better option. Move, duplicate, and remove pages as needed until you have a PDF you can play by flipping straight through. You can even use the white marker annotation preset to cover up parts of each page that you won’t need on each pass. What app do you prefer for a music reader? This app looks great for full scores. I lead and play guitar, and I have found OnSong to be fabulous. I’ve been using it for several years now, and wouldn’t trade it. Rather than full scores, it deals best with chord charts. 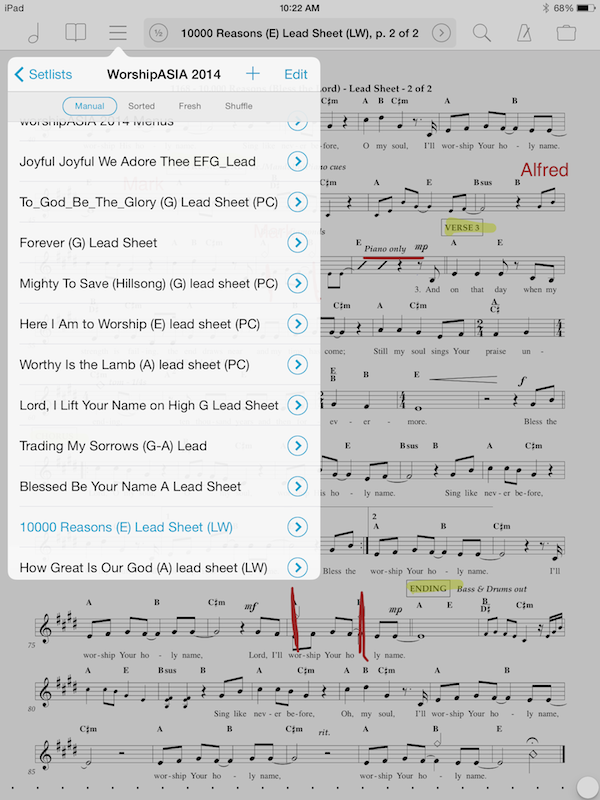 You can import pdfs of full sheet music, but you won’t get the full power of the program. You can transpose at the touch of a finger, highlight, and the ability to mark-up is an add-on that I gladly paid a couple dollars for. One other very useful feature is that you can put in a length for the song, and it scrolls ever-so-slightly so that you can look away from your music, and when you look back at the screen, you just have to look at the same area of the screen to see where you are in the song — no searching the page to find your place. 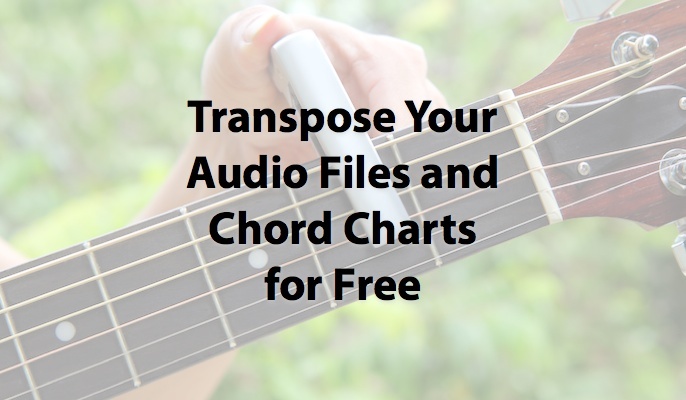 The app is really powerful, even able to project lyrics at the same time as you are using it for your own chord chart. 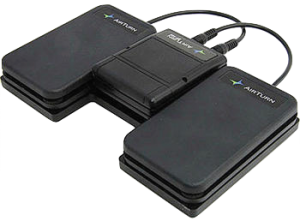 It can organize sets and beam them to other users as well – I have a couple other guys in our praise band also using it now, and I just beam them the set each Friday night at practice. If you’re using a chord chart rather than a score, I highly recommend OnSong. I have used Deep Dish Gigbook on my ipad for about 10 months or so and love it. It is so awesome to be free of the paper clutter and three ring binders! No more losing or refiling music! I have found the audio link feature especially helpful in personal and group rehearsal. 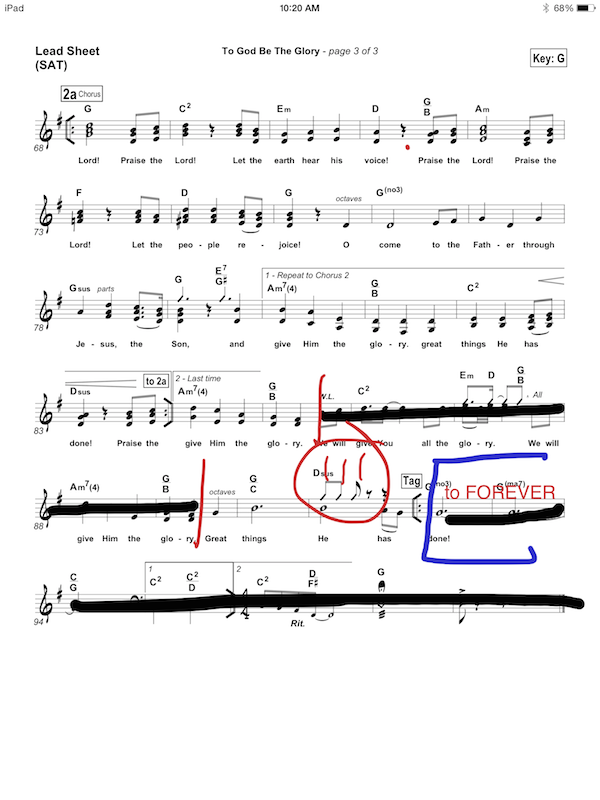 Forscore looks very similar, but does do a few things Gigbook doesn’t (crop, stamps, rearrange for repeats). If I had seen it earlier I would definitely have looked at Forscore.